How Far Do You Hit It, Really? We all think we hit it farther than we do. You hear that a lot. Actually, I think each of us has a very good idea of how far we hit it. It’s just not as far as we would like. This chart tells the approximate truth. If you have a swing speed with your driver of 95 mph, which is high for the majority of recreational golfers, you will carry the ball 210 yards. With adequate roll, you can get about 225 yards out of that shot. Now roll is highly variable. Have you ever seen an aerial shot of a Tour event and there’s a shot of a drive that falls straight out of the sky and maybe gets two yards of roll? But, it was hit in the air a ton. Recreational golfers don’t hit those kinds of shots. Ours go lower and roll more. So don’t kid yourself. If you are an average recreational golfer and you hit your driver 200 yards in the air, that’s a good shot. Add on maybe 15-20 yards of roll and you can play with that length. Want to hit it farther? Assuming you hit the ball on the center of the clubface regularly (and that’s a big assumption) you’ll hit it farther by swinging faster AND maintaining good tempo. A more lofted driver might help, too, but that’s another post. A few years ago I started advising anyone who would listen that this is the way to build a competent, consistent golf swing. Hit wedges, lots of wedges. Take the club back halfway, swing through to a full finish. This is my second post on the subject, hence the quantifier in the title. But the notion is so important that I don’t want to let it be one and done because you might never find that first post. So I’m posting the idea again. Actually, I should post it every other week, it’s that important, but that probably would create a different impression in your mind than emphasis, so I won’t. There are three reasons why this is such an important drill. One. It teaches you how to bring the club into the hitting area, through impact, and into your follow-through. If you want to work hard on the Six Fundamentals, this is the drill to use. Because it is a short swing, you can concentrate on getting those parts of it just right. Two. 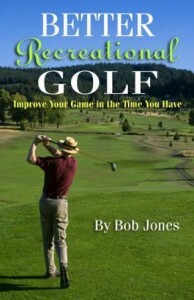 It teaches you how to hit your longer pitch shots, probably the last shot recreational golfers learn to hit well. You can drop a lot of strokes off your score if you expect to get down in three from 75 yards, and maybe two, than down in four and maybe three. Three. This is the big one. If you hit enough of these shots, you will create a swing feeling in your mind that is not tied in any way to your technique. You train your mind to just step up and swing automatically. Believe me, you will play much more consistently if you can learn to do that. Drill. Take your sand wedge to the range. Just that one club. Make four dry (no ball in front of you) half-wedge swings. Swing halfway going back, and follow through to a full finish. After the four dry swings, pull a ball forward and make the same swing without thinking of the ball. Just repeat what you did four times. When making your dry swings, do not take too long between them. Take just a few seconds to get set up again and swing. You’re not rushing, but what I want you to avoid is giving yourself enough time to think about what you’re doing. I don’t want you to think. I want you to swing. Then when you pull the ball over to hit it, keep up that same rhythm instead of thinking, “OK, now I’m going to hit a golf ball,” or anything else. Just swing. Say you have a small bucket with 30 golf balls. That will be 150 swings. That’s a lot of practice which will pay off if repeated frequently. If you do this all winter, every time you go to the range, I guarantee your swing will be miles better next spring than it is now. Heck, you can even do this drill, without golf balls, of course, in your living room. * Put down a throw rug underneath your club so you don’t scuff your carpet. Swing five times and take a break for a minute. Repeat nine times. Do this daily, or as often as you can get to it, and you’ll get in a LOT of practice that will pay off more than you know. And like I said, your swing will be miles better next spring than it is now. * What about the ceiling? I’m 6’6” tall, and with a sand wedge I don’t even come close to hitting my 8-foot ceiling at any time. I’m writing this post for the better golfers among my readers, the ones who shoot in the low 80s and high 70s. While it is true that lowering your score from here depends on improving your short game and putting, don’t think that you are finished with your swing just yet. Up to this point you have likely thought that the purpose of the swing has been to hit the ball. Your swing starts at the ball and ends when the ball is struck. Thinking like that keeps you stuck in technical details that makes you swing not fully reliable. While you hit a large number of good shots, you aren’t really sure beforehand that you’re going to hit one. You might be thinking that one more tip that will pull everything together. What you need instead is a new conception of the swing. The golf swing is built on mechanics and the ones that you have put together to build your swing may not be ignored. But the point of learning the swing is to play golf. And you play your best golf not by doing what it takes to hit the ball, but by doing what it takes to swing through to the finish. You might have heard a professional golfer say that he just swings and the ball gets in the way. That’s correct, but let’s go deeper than that. When a top-rank golfer stands over the ball, he feels the feeling of a good shot. He already knows how it should feel and his body responds to that feeling. Other golfers have no such feeling ahead of time which is why their good shots come as such a surprise. A good golfer plays the shot based on his feeling of a good golf shot and plays through to the finish. The lesser golfer plays the shot based on his knowledge of good technique. All this, again, begins with the setup. The right setup allows correct movements to occur and prevents the wrong ones. But more than that, it creates the feel of a good shot, which is what the player uses to play the game. So if you have gotten to single-digit golf but seem to be stuck, it might well be that your technique is sufficient. What you need to do next is to adopt a different conception of what you’re doing when you approach the ball. 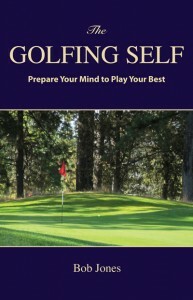 These ideas come from the book On Learning Golf, by Percy Boomer. 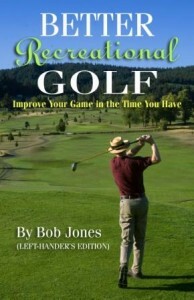 It is likely the most valuable golf instruction book ever written.